The following engraving, drawn by artist, historian and travel writer John Badger Bachelder, was first printed in the 1874, second edition of “Bachelder’s Illustrated Tourist’s Guide of The United States – Popular Resorts and How to Reach Them”. Bachelder’s color sketch of the scene is available on the New Hampshire Historical Society website here. Bachelder’s guidebook was first published in Boston in 1873. The first edition was really two books in one, as it had extensive coverage of Gettysburg (“What to See, and How to See It”) for its first 150 pages. Only about 75 pages of the first edition were devoted to the rest of the USA. The first edition did not include an engraving of Weirs Landing. The second edition dropped the coverage of Gettysburg (for which Bachelder became famous) and devoted its nearly 200 pages to travels across the USA (primarily the Northeastern US). The Weirs engraving and information was repeated in the third edition in 1875, and in a fourth, final edition in 1876. The following engraving is the oldest depiction of Weirs Beach that you will find anywhere on this website. It was printed in the July 30th, 1859 issue of Ballou’s Pictorial. 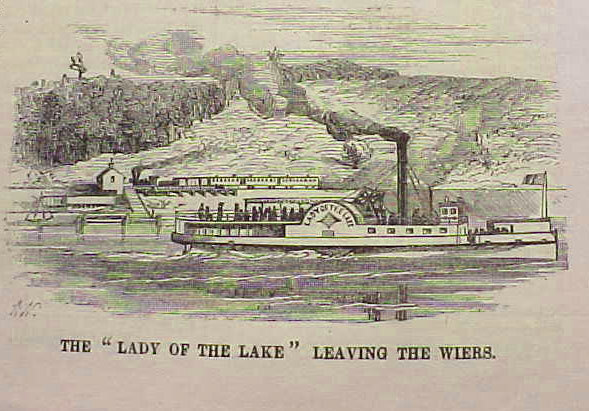 The engraving depicts the Lady of the Lake leaving Weirs Beach. Clearly shown in the engraving are the original train station and a ramp leading down to the Lake. No other buildings appear in the engraving. Development of Weirs Beach not yet begun. 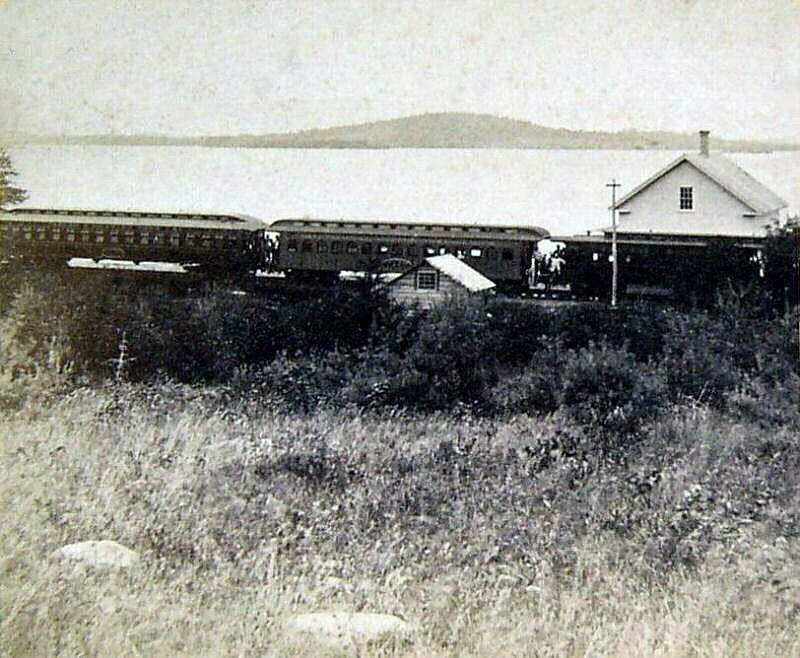 This is a very rare, circa 1869 photograph of the original Weirs Beach train station. It was part of a stereoview (#351) by the Kilburn Brothers. In 1869, Lakeside Avenue was a meadow! The street was probably cleared of brush in the mid or late 1870’s. On January 5, 1883, the Laconia Democrat newspaper reported, “At the Weirs, the new road from the railroad bridge to Doe’s brickyard is under good headway.” The road was initially called Railroad Avenue, and it was completed by the end of May, 1883. It is unknown exactly when the street was renamed Lakeside Avenue, but in the 1910’s, the new name was well established. 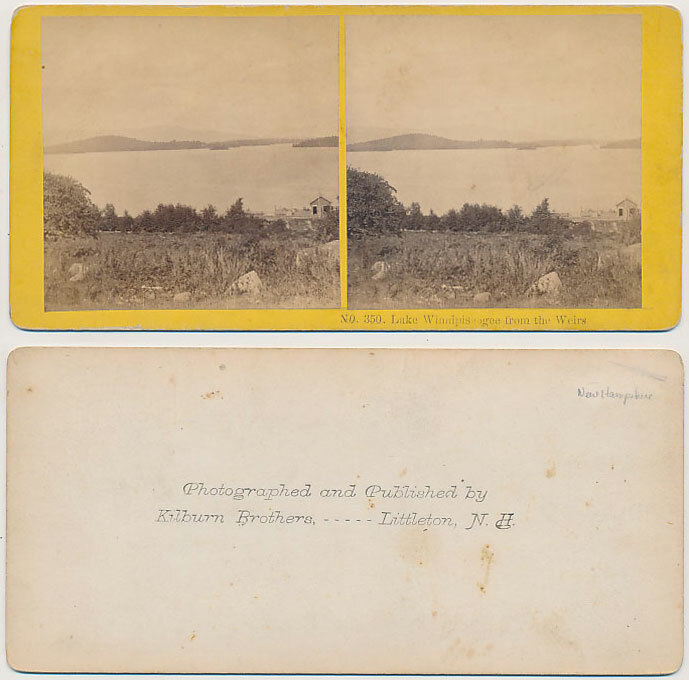 Kilburn stereoview #350 is the oldest photograph of Weirs Beach in existence. The “station” is just a shack with no chimney, unlike the more house-like structure in Kilburn #351. Thus, the original “station” was actually a series of small buildings. A historical account by Theo S. Jewett states that the Weirs station and the attached wharf burned on March 11, 1871. It must have been replaced by a similar, small building, until a much grander replacement in 1880, the Second Weirs Beach Train Station. 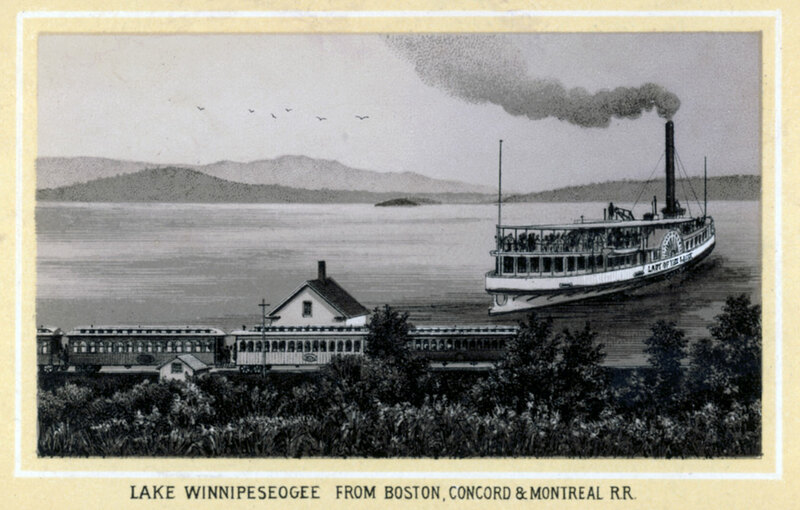 Below, a drawing from a viewbook of the White Mountains published by the Wittemann Bros., 184 William St, New York, shows the Lady of the Lake steaming away from the original train station and wharf. The viewbook was copyrighted in 1877 by “Lindsey & French, Fabyan House, White Mountains, NH”, with “Photo-Lith” by Louise Glaser. 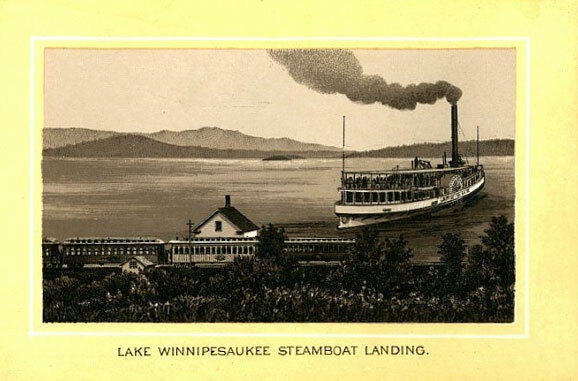 Identical to the drawing above, the later version below uses the alternate spelling of Lake Winnipesaukee and was published in 1882, also by the Wittemann Bros. 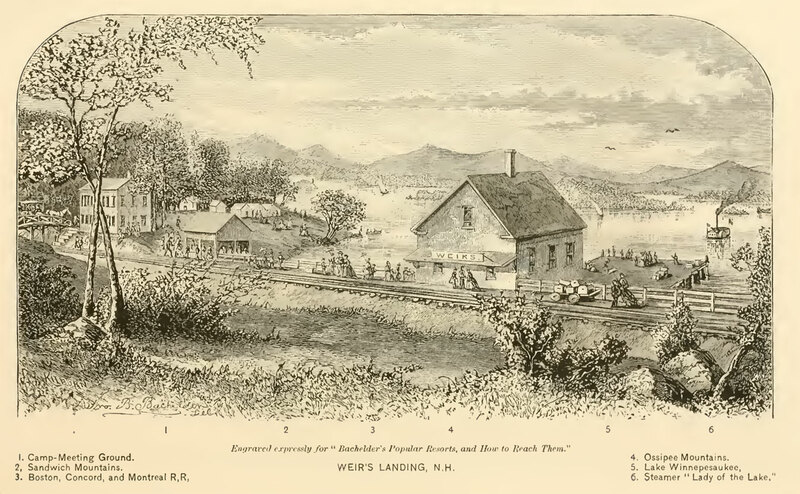 However, the drawing was not accurately depicting the Weirs Beach of that time, as by 1882 the second train station and Railroad Avenue had already been built. 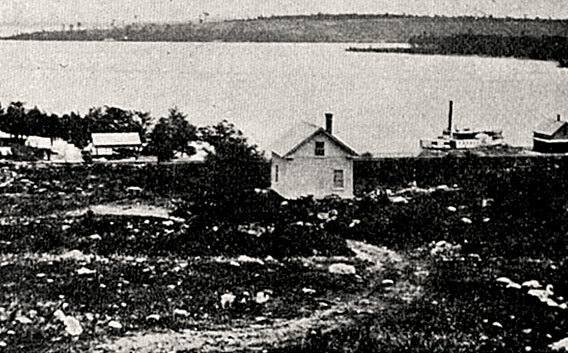 Another view of the original train station (right edge of picture), from a distance, shows the Lady at her dock. 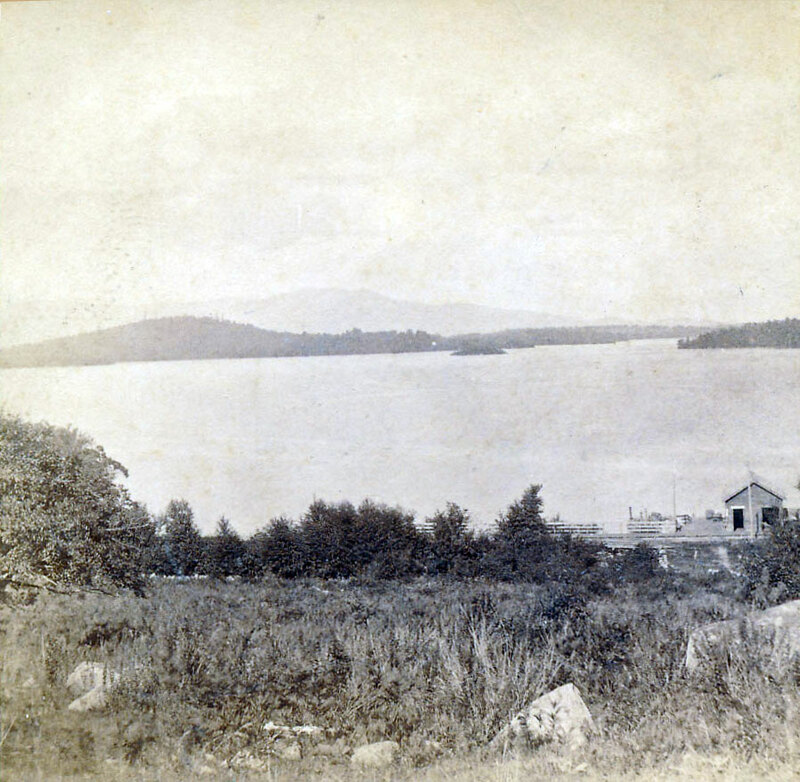 The house in the center of the picture is unknown. There were three more Weirs Beach train stations to come, before the current, fifth Weirs Beach train station.